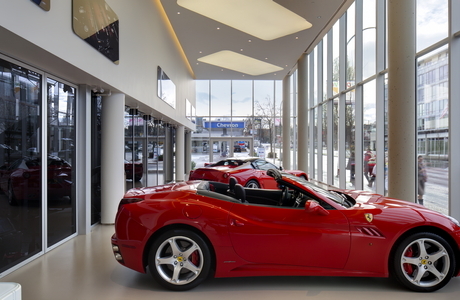 When Ferrari & Maserati of Vancouver retained the leading firm of James K.M. Cheng Architects Inc., they knew they would get a signature building with a modern, sleek image. 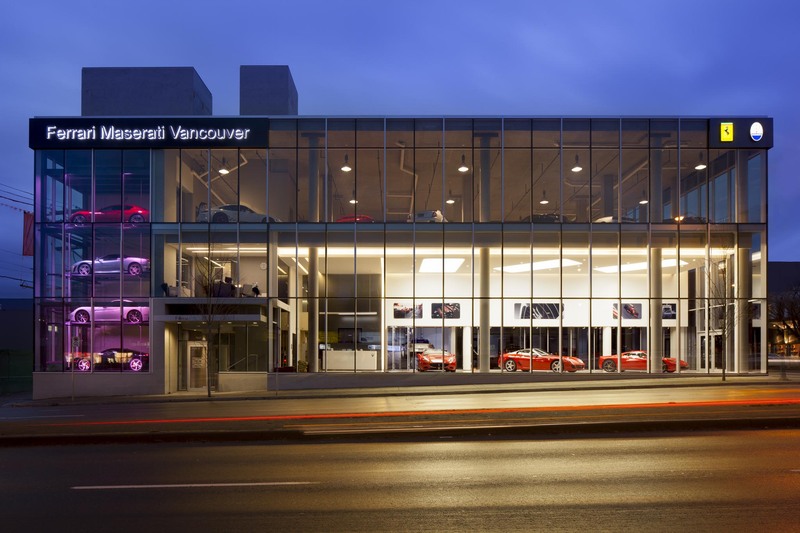 It was true: Automobile industry media called the new, three-story glass box “beautiful” when it opened in 2010 on Burrard Street, adding a dash of museum-quality minimalism to the heart of the automotive district. The $12 million building features many of the signature elements favored by Cheng, who is a well-known architect globally with something of an A-list status in Vancouver. Cheng brought in a vehicle display elevator, reflecting his interest in transparency and high-tech systems. The sleek, contemporary architecture projects a European feel, while the “glass exterior makes for a grand exhibit,” said one industry blogger. 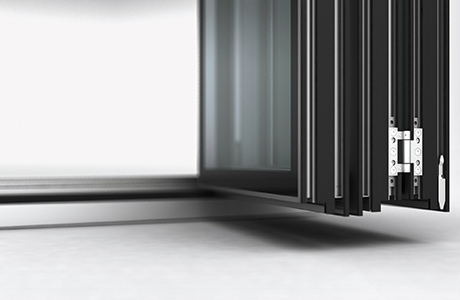 “Quality design and fabrication,” Cheng explains, was the key reason that he selected the NanaWall SL45 folding wall system, rather than another kind of glass door. 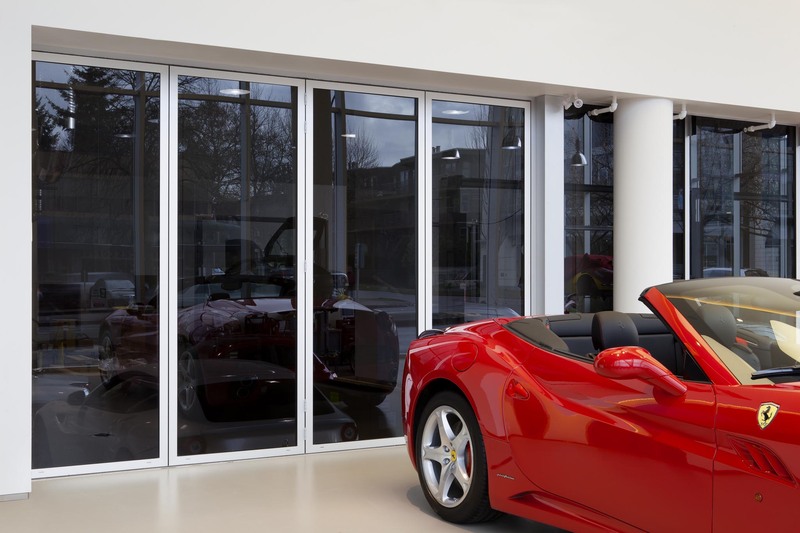 Four Ferrari supercars – the 288 GTO, F40, F50 and Enzo – are stacked up in a special display rack custom-designed for the entry, visible through the main glass façade. LED lighting, with custom fixtures, create drama and excitement both day and night. With NanaWall’s operable walls that could be stacked in relatively small spaces, Cheng was able to overcome many of these constraints to add flexible showrooms and improve the client’s rotation of inventory in the 35,000-square-foot interiors. Yet Cheng chose NanaWall over other wall solutions for reasons that resonate with fans of high-quality automobiles. 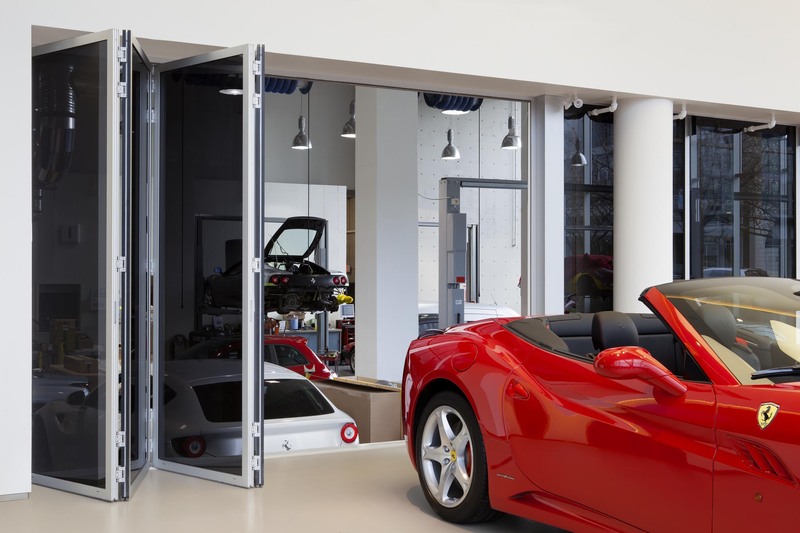 Cheng’s attention to detail – one of the hallmarks of his modern, design-forward designs – is evident throughout “the gleaming new Ferrari of Vancouver facility,” according to Ferrari North America’s communications team. It replaces an older dealership store located about four miles away, stacking the second-floor Maserati showroom atop the Ferraris that occupy the first floor, with room for three cars. On the third floor, the compact floor plan allows for a selection of luxury used cars from the dealership’s inventory. 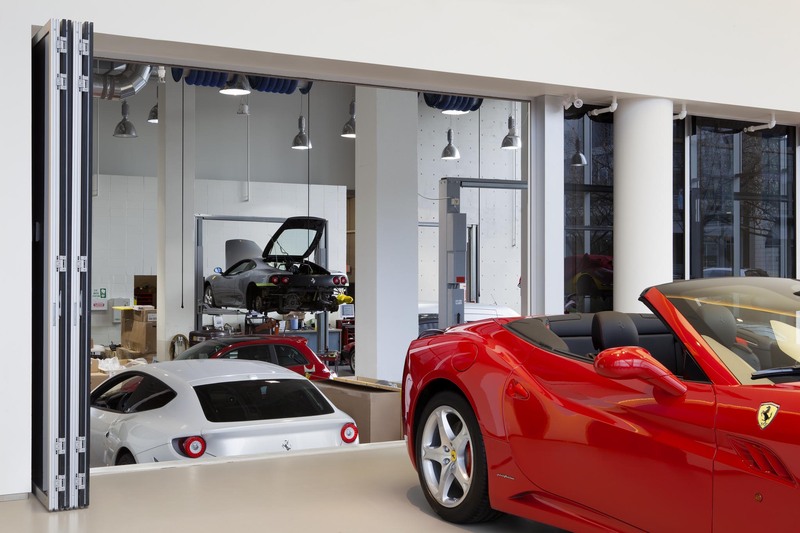 “This is a much better location than the previous building,” said Richard Sherbert, vice president of operations for Ferrari of Vancouver, when the building opened. Since then, the glass-walled observation area in the second-floor customer lounge has been a highlight of customer visits, allowing them to see the latest models up close. A new “Atelier” section allows an even more interactive approach, where “Clients can see and touch the various seat options, leathers, wheels and brake options, and more,” according to Ferrari. Most enticing is the row of cars, set an angle in an elevated storefront display between the crisp glass curtain wall and the service bays and showroom areas inside. Separating the street display are the low-height NanaWall SL45 folding walls, which Cheng specified with a special tint for enhanced performance as well as to block views into the service area behind, when needed. This clever design by Cheng is hardly noticed by passersby, because it places the eye’s focus where it belongs – on the Italian engineering of today’s most powerful sports supercars.